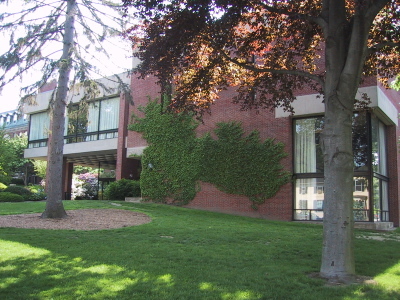 "The Music Building," as this building was known until 1999 when it was given the name "The Winifred E. and Robert Arms Music Center," was built in 1967-68. 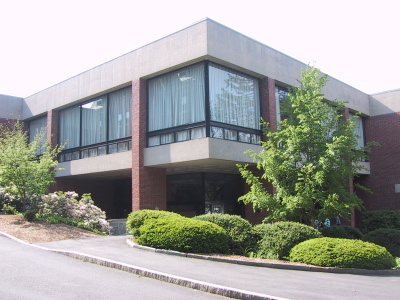 According to the Amherst Archives and Special Collections, the building was designed by the architect Benjamin Thompson, and the ground for the building was broken on June 15, 1966. Prior to the construction of the building, the music department was housed in The Octagon, College Hall, and even the sub-basement of Frost Library, where the Glee Club rehearsed for a few semesters. The building was completed in September 1968 at a cost of $1.1 million. (A & SC, Buildings and Grounds Collection, box 14, folders 44 and 46). (Photos taken 1 June 2002).